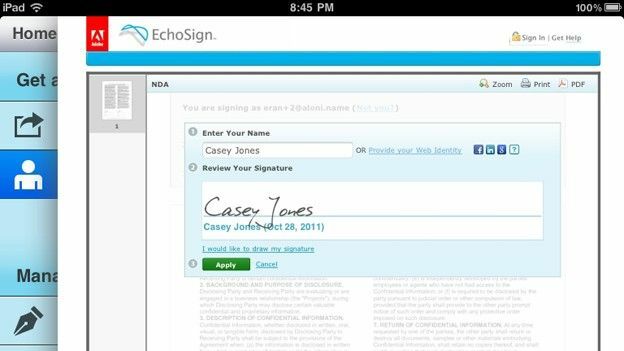 Users can access their EchoSign accounts and sign documents directly from their iPhone, iPad and iPod touch devices. The app is available for free download on the iTunes App Store. Documents can be sent from the EchoSign library, photo album, email attachment or from other apps like Box.net and Dropbox. Users can also track the status of agreements with real-time status updates, and view all signed agreements from the app's account. According to the firm, the Adobe EchoSign app offers the same protection as the Adobe EchoSign Web service for both the sender and the signer during the signing process, including key authentication and privacy, fraud protection, and consumer disclosure. Jason Lemkin, vice president of Web business services, Adobe and former CEO, EchoSign, said: "With the Adobe EchoSign app, we're making it that much easier for organizations to incorporate Web contracting into their business models, allowing users to sign documents and send documents for signing right from their iOS device. The end result is a higher rate of contract completion in less time, leading to increased productivity." The software was acquired by Adobe in July 2011. Have you used EchoSign before; what do you think of the app? Let us know through Twitter and Facebook or leave a comment.